When teaching a Baseball Practice Drill remember Baseball is an amazingly simple game …Catch, Throw, Hit … can’t get much simpler than that, Right? Well, sort of. The major three concepts, in theory are relatively simple, but for the intricate cogs which make up these concepts, which power the machine … that’s another story. We’re going to exam some Specialized Drills which apply to a higher level skill set which will take your game to the next level. 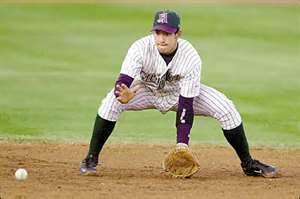 We are taught from Tee-ball forward to always attempt to field a ground ball by keeping it in front of you. This is good solid coaching, as this position offers the best view of the ball approaching, enables the player to comfortably place his glove on the ground, provides the best possible feet position in order to quickly enter your throwing motion, and last but not least, your body becomes a backstop should the ball suddenly take a bad bounce. However, there are times an infielder may Not want to field a ground ball by being squarely in front of it, but would be better positioned to field it off to his Glove side. This is especially true of the left side of the infield, although there are similar advantages on the right side, just not normally as often. Here’s the scenario… There is an extremely fast runner on first base with a good runner batting, which makes turning a normal, ground ball double play extremely difficult if not impossible. If you’ve reviewed the sections on turning a double play you’ll remember, although there are many elements involved in the turning of a double play which must be learned, Nothing Beats Speed. The batter hits a rather sharp ground ball, but not a scorcher, nearly directly at the third baseman. The fielder has essentially two options…. 1. Take a small step forward, which places him in front of the bouncing ball, field it, become set and snap throw to second. This is excellent technique and there’s nothing wrong with it except… it will take the fielder a split second to plant his right foot in order to push off, and twist his hips towards second base to prevent throwing across his body and losing velocity. It must be noted and considered there are inherent dangers in fielding the ball off to the side as you eliminate the body being a back stop. Should you misplay the ball it’s going into left field instead of bouncing off your chest and landing in front of you where you still may get 1 out at first. The Squeeze Play or Squeeze Bunt is probably one of the most exciting plays in baseball, but because of its inherent danger, goof the play and the runner is a sitting duck, and the rarity of using the play, it’s rarely practiced. It’s these very reasons which make the squeeze play so effective when used, so we’re going to exam the various elements involved in pulling off a successful squeeze bunt. The element of Surprise is paramount to a successful squeeze play! If the opposition has the slightest indication the squeeze is on, they’ll counter with a pitch out and the runner will be put out 99% of the time. With that in mind, let’s look at each player’s responsibilities. Base Runner: The runner on third should act no different on a squeeze play than any other pitch. The play does Not require the runner to alter his lead by increasing or decreasing it. 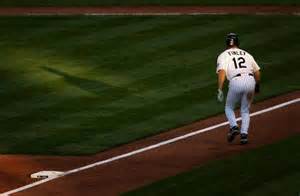 You may argue if the runner increases his lead by 2’ that puts him 2’ closer to home plate. Although mathematically correct, the risk of tipping your play off, which means running into an automatic out, increases 50% - 70% depending on how well coached the opposition is, and if the play is executed correctly that 2’ means nothing. The runner should take his normal lead off, in Foul Territory! The next action depends on whether the pitcher is using the stretch or a full windup delivery. 1. If the pitcher is using the Stretch pitching motion, be sure he is committed to going home before you break for home plate. Nothing ends a squeeze play quicker than being picked off third by running too soon. 2. If the pitcher is using the full windup, you can take off for home plate as soon as be begins his motion, because if he stops it’s a balk and you’re awarded home plate. However, use caution when applying this rule of thumb. A. Although he can’t stop his motion, if a right handed pitcher hasn’t turned his head towards the plate, he will see you take off early. A Wiley pitcher will throw the ball outside or high making bunting the ball extremely difficult and could mean a busted play resulting in the runner being tagged out. Once you commit to going home, Never Stop or Hesitate! You are in what’s commonly called “No Mans Land” and to do anything other than continue the play will most likely end in you being put out in a rundown. Run hard and slide feet first into the left field side of home plate. (The side facing you as you approach) Don’t worry about what the other players are doing as you can only control what you’re doing. Batter: Exactly as the runner must do, the batter Can Not tip off the play, but must act as normal as possible. Do not take huge practice swings or beat on home plate with your bat if you don’t normally do that at every bat. And if you do these things … stop. It’s not professional and serves no purpose. Assume your normal batting stance and position. If you think you can fudge your stance a few inches towards the pitcher without being noticed, do it, but don’t exaggerate the distance or call attention to yourself. If in doubt … Don’t Try It. It’s redundant to state because your bat should always be in Fair Territory when contact with the ball is made, but it’s extra important on a squeeze play, that’s why the suggestion to look at possibly cheating a couple of inches forward. This is Not a Sacrifice Bunt, so you must resist the urge to square around as soon as the pitcher begins his delivery. Show the bunt too soon and similar to the runner leaving too early, the pitcher will throw a pitch hard to bunt. You don’t have to wait until the ball is out of his hand, although that’s best, but he must be at his release point before you begin to square around. 1. You Must make contact with the ball !! If the pitch is high … get on your tip toes. If the pitch is a foot outside … throw your bat at it. Bottom line … you miss the ball … the runner is out. 2. Your goal is to bunt the ball on the ground. It’ll be a fair ball because your bat will be in fair territory, so don’t worry about that. But second to making contact is to put the ball on the ground. A pop-up can easily become a double play. 3. Get out of the way fast. Don’t hesitate watching the ball. You’re also bunting for a base hit, so get out of the batters box and down the first base line quickly. More importantly, your team mate is coming hard and fast to home plate and you don’t want to be in the box when he slides in. There’s also the situation of interference but we’re not discussing that because you’ve laid down a perfect bunt. Communication is imperative when calling a squeeze play bunt, not only for a successful play, but more importantly for Safety Reasons. A batter missing the sign and swinging away instead of bunting, with a hard charging player coming in, can have Catastrophic consequences. In order to avoid such an unthinkable situation there Must be an Original Sign, calling or putting on the play … and a Reply or Acknowledgement Sign which verifies the batter and the runner both know what’s about to happen. Unless you played the same team last night they have no way of knowing if the batter hit a home run the previous night or not. I always called the play before the batter entered the batters box. A. Upon hearing and understanding the signal, he would adjust his helmet indicating to me and the runner he would be bunting before he entered the box. B. The runner also adjusted his helmet letting the batter know he was coming. If there was any doubt on my part that everyone was on the same, I’d immediately call time out, which canceled the play. These are only two of hundreds of skill specific plays in which to practice, but you’ve added one more skill to your offensive and defensive arsenal and they will add up.